Long before Germany's blitzkrieg swept the West, European leaders had received many signals of its imminence. Stalin, too, had abundant warning of German designs on Russia but believed that by avoiding "provocative" defensive measures he could avert the attack that finally came in June 1941. And the stories of the Japanese attack on Pearl Harbor, the Korean War, and three Arab-Israeli conflicts are replete with missed opportunities to react to unmistakable warnings. 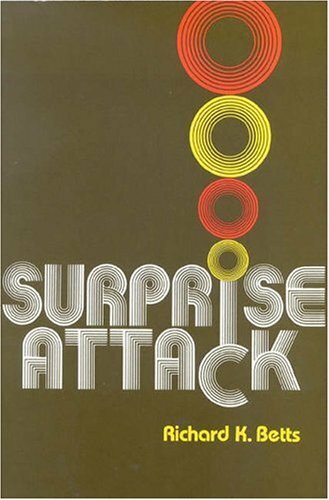 Richad K. Betts analyzes surprise attacks during the mid-twentieth century to illustrate his thesis: surprise attacks occur, not because intelligence services fail to warn, but because of the disbelief of political leaders. "Although the probability is low that the United States will fail to deter direct attack by the Soviet Union," Betts says, "the intensity of the threat warrants painstaking analysis of how to cope with it." His own investigation of the historical, psychological, political, diplomatic, and military aspects of his subject heightens understanding of why surprise attacks succeed and why victim nations fail to respond to warnings. In discussing current policy he focuses on the defense of Western Europe and applies the lessons of history to U.S. defense planning, offering detailed recommendations for changes in strategy. Obviously some of the potential dangers of military surprise cannot be prevented. The important thing, he emphasizes, is that "without forces that exceed requirements (the solution Moscow appears to have chosen), it is vital to ensure that what forces exist can be brought to bear when needed.